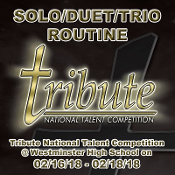 Purchase this product to receive both photos and video from your solo, duet and / or trio at Tribute National Talent Competition 2018 as performed at Westminster High School on February 16 - 18, 2018. Delivery format for both photos and video is a digital download, when ready. If you have already submitted a survey interest form via our first communication, and you provided your dance routine name(s) there, simply enter "See Survey" in the Dance Performance Routine Name(s) box below. Otherwise, enter the routine name(s) and the number of routines you are interested in purchasing. Thank you! NOTE: Please change the quantity to reflect the actual number of solo / duet / trio routines you wish to order. The reflected price is for 1 routine only. Also, if you can provide the routine number as it was listed in the Tribute program, that would also be immensely helpful. Thank you!